Human Factor – Behavioral issues with people regarding fire alarms & emergencies. Design and documentation of Fire Evacuation Plans & Records. Identifying and Managing Personal Emergency Evacuation Plans (PEEPS). 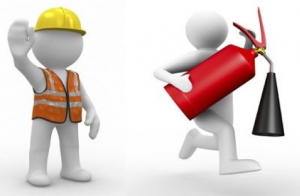 Fire Drills – Running, Management & Evaluation of Fire Drills. Trainee will give a presentation on a course topic. Instructor & trainee feedback and evaluation. Participants will complete a practical Fire Risk Assessment as part of their assessment. Each participant will give a practical demonstration in the use of a foam and CO2 fire extinguisher. A written assessment will also be given at the end of the course. Participants will receive a USB Flash Drive containing complete Trainers Start-up Pack with everything from your attendance & assessment sheets to your PowerPoint slideshow. There will be links to relevant Legislation, HSA Guidance documents & checklists. We also encourage our participants to join us and present on our own Fire Warden training courses, to give them added confidence and experience, should they require it. A 5-year Fire Warden-Marshal Instructor Certificate and Instructor Card is awarded to all participants on successful completion of this course.